I have to admit that I was skeptical about the cupcake craze that began some six years ago. Every city that I travel to somehow has a cupcake store. I have been to Magnolia and their cupcakes were definitely nothing to write about. So when my friend Phillip suggested we go for cupcakes, I was a little hesitant but I decided to give in and just go with the flow. We bought three cupcakes (red velvet, sour cream spice with walnuts and “devil dog” a cupcake topped with a marshmallow frosting) and a serving of chocolate trifle, which Matt and Phillip swear by. 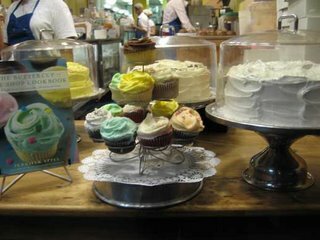 The buttercup bakeshop is simple in its approach to old-fashioned desserts. They produce favourites such as carrot cake, coconut layer cakes, red velvet cakes, cheesecakes and a host of other comfort desserts. The cupcakes, cakes and desserts here are simple and satisfying, they don’t pretend to be anything other than what they are. 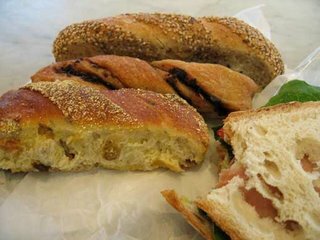 With three locations and fourteen years of being in the bread business, Amy’s Bread is a reliable venue for all your bread needs. They have a good selection of breads, which include: organic, whole wheat, black olive, rosemary, sourdough, semolina and a range of specialty breads. Since I was having lunch alone, I had one of their Tuscan sandwiches, which contained proscuitto, provolone, tomatoes, lettuce and herbs. I also sampled their seeded, black olive and semolina, raisin and fennel twists. If you love bread as much as I do, stop by and pick up some bread from Amy’s. Fleur de Sel, a well known New York restaurant, French cuisine. Try their amazingly priced 3 course $25 or 4 course $42 tasting menu at lunch. I had the 4 course tasting and it was fantastic. La Bergamote, a good and reliable French patisserie with the standard fare. Three Tarts, the store is half collectibles and half edibles. The edibles include: cookies, petit fours, parfaits, sorbets, tarts and chocolates. Oms/b, rice ball café with a small selection of desserts. I hope that these posts will help you on your next trip to New York. See more pictures of my New York Dessert Adventure. Posted by Sam at 6:26 p.m. I simply must get to NY one of these days! I hope do and when you do let me know and I would be happy to give you a list of places to check out.